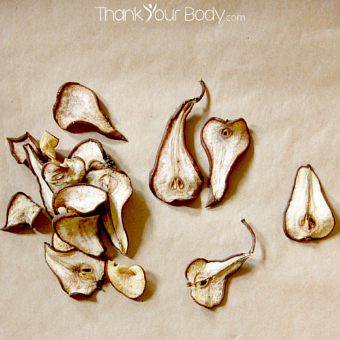 Wash, then quarter and core pears, placing them in a heavy-bottom preserving pan as you work. Add water. Do not add more liquid, the pears will create liquid as they cook! Bring to a simmer over low heat, then cover tightly with a lid to keep heat and moisture in. Simmer for approximately 20 minutes, or until pears have softened, then remove pan from heat. Mash pears with a potato masher until they are mushy (approximately 15-30 seconds). Add one 2-3-inch piece of vanilla bean. Add the remaining spices into the pear puree mixture. Stir well to combine. Cook approximately one hour over low heat, simmering constantly. It will be more of a burble than a simmer, because of the thickening nature of the pear butter. Once desired thickness has been achieved, remove the preserving pan from the heat and remove the vanilla bean, then spoon mixture immediately into hot sterilized jars, leaving ¼-inch headspace. Note: If you are using vanilla extract instead of a vanilla bean, add it at the end of the cooking process, when you would normally be removing the vanilla bean. 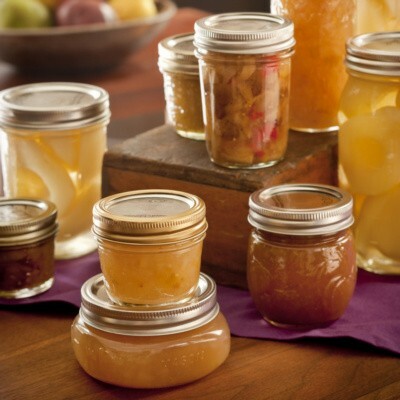 Look for any air bubbles in the jars and if you see any, use a knife to remove them before wiping rims clean and sealing according to USDA instructions. Process for 10 minutes in a boiling water bath. I haven’t made it yet but it looks absolutely amazing!!! You get high marks just for being Brown Sugar Pear Butter as I LOVE Apple Butter since birth! I moved from Indianapolis to Bowling Green, Kentucky last fall and have this enormous pear tree in my back yard. They are delicious! I have a question about the recipe and since it doesn’t say to put the lid back on, I’m assuming off, but not sure. After the initial cooking and milling of the pears when the vanilla and spices are added with the pear mush back to the pan to simmer (burble) for an hour, is that lid on or off? Thank you and I’m so happy to have discovered this site. Looking forward to many more recipes in my pear future!